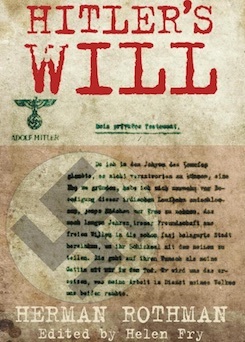 The discovery of Hitler’s Will, sewn into the lining of the jacket of his press attaché and brought out of the bunker, caused a massive stir amongst British Intelligence circles at the end of WW2. Such was the secrecy surrounding its finding that every effort was made to keep it out of the public domain. The last surviving witness to the extraordinary discovery of Hitler’s last Wills and Testament has finally been told. Herman Rothman’s translation of Goebbels Addendum to Hitler’s Political Will, and the ensuing investigation into the exact circumstances of Hitler’s suicide, is one of the most astonishing stories of the twentieth century. This book is also the story of Herman himself, the last surviving German-speaking interrogator of the 3rd Counter-Intelligence Section of the British Army who was part of the team that found and translated Hitler’s political and personal wills and Goebbels’ addendum. The book is about one family’s desperate fight for survival against Hitler’s desire to kill all the Jews. Returning to Germany in British army uniform, Herman was assigned to the Intelligence Corps in post-war Germany, the land where he had been born. He was engaged on the interrogation of key Nazi war criminals and guards, including those who were present in the bunker at the time of Hitler’s suicide. He had just witnessed too the horror of Bergen-Belsen after its liberation, but he was desperate to demonstrate the order of law, to uphold human rights, and show that despite the personal trauma of the Hitler regime, he could be above the emotion of revenge. A powerful story, it formed the basis of the Channel 5 documentary The Hunt for Hitler’s Missing Millions (2014) in which he and Helen appeared.